Participants learning how to use the scoring method during an ACGG data collectors training in Ethiopia (photo credit: ILRI/Annet Mulema). 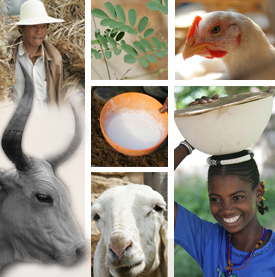 Drawing on recommendations from the newly devised gender strategy, the African Chicken Genetic Gains (ACGG) project is set to study how empowerment or disempowerment and gender dynamics influence smallholder chicken production in Ethiopia. 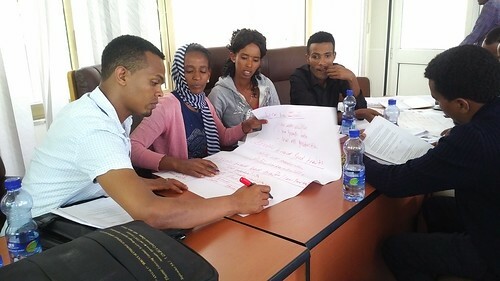 To further practice and reflect on the research process and methodology, the research team engaged in a two-day pilot exercise in two nearby communities in Addis Ababa. The experience helped the team to get acquainted with the expected logistical challenges during the actual data collection and learn how to deal with them. The research team will start data collection end of May 2018, and the team is expected to produce a draft report by the end of the data collection fieldwork. A similar study has been conducted in the other two ACGG countries – Nigeria and Tanzania. The results will aid the development of a comprehensive framework for the ACGG project to attain its goal of empowering women and men, and also inform selection of chicken strains that are socially and economically likable and thrive in the different agro-ecological environments. The study will also validate results from the quantitative study. Annet Mulema, a gender expert at the International Livestock Research Institute (ILRI) delivered the training with the support from ACGG gender focal person, Jabrail Hassen, and principal investigator Solomon Abegaz. The training was organized at the Ethiopian Institute of Agriculture Research in Addis Ababa. Tags: ACGG, Ethiopia, Gender strategy, Nigeria, study, Tanzania. Bookmark the permalink.